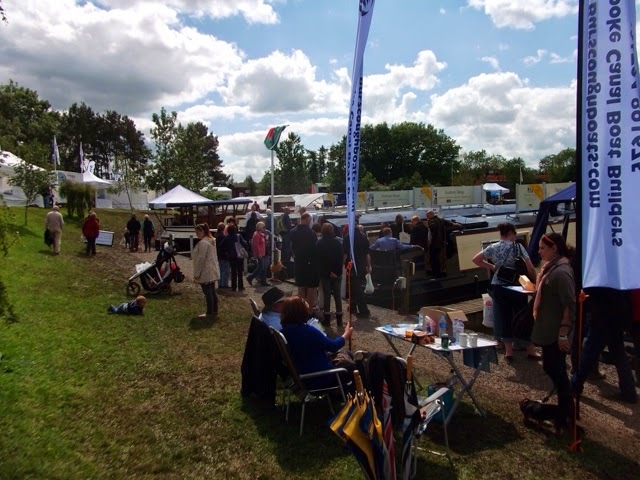 Well the boatshow finally arrived and lived up to its reputation with regards to the weather. We arrived at 10am on the Saturday and the rain as forecast was quickly turning the carpark field into a mud bath. So raincoats and wellies were donned and we quickly made our way to the Hudson area. We wanted to be one of the first to view her clear of tools and protective coverings. We were not disappointed. Achernar was centre stage of the Hudson trio and attention was drawn immediately to the gleaming Francis searchlight. Martin who was taking care of Achernar kindly closed the doors to allow a period of private viewing before the public were granted access. We then hit the stalls with our shopping list. 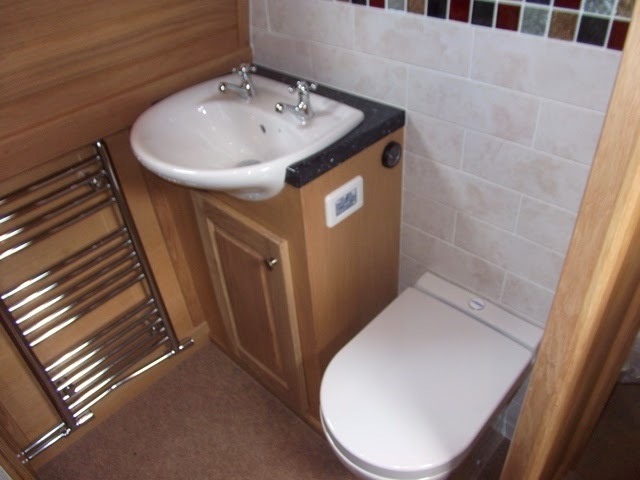 Items required included an ecofan,satellite dish,porta potti (for emergency use only),rotary washing line and some floor matting for the well deck. 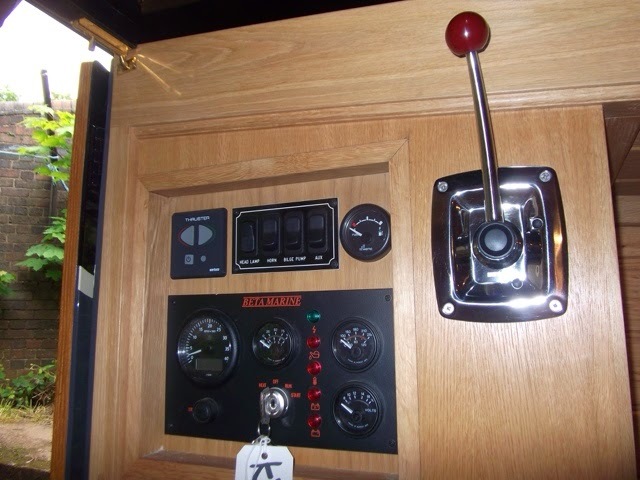 View of the galley. Washing machine in right hand cupboard. 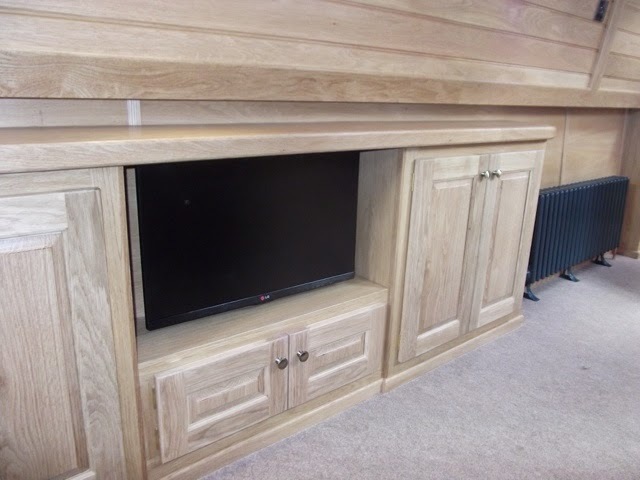 Cabinet with tv installed. Cast iron radiator to the right. 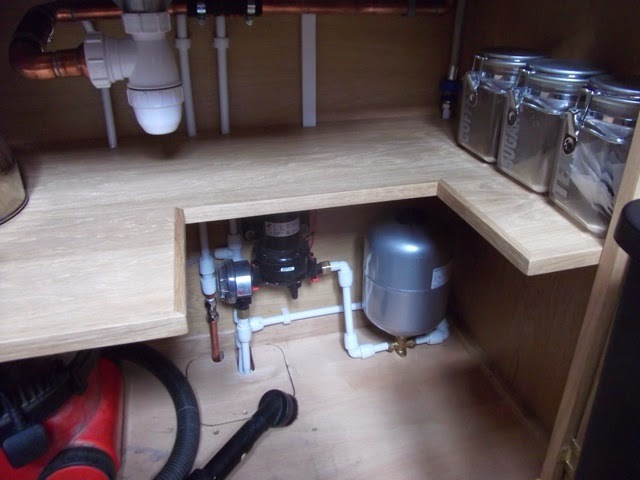 Water pump,accumulator and water purifier beneath the sink area. 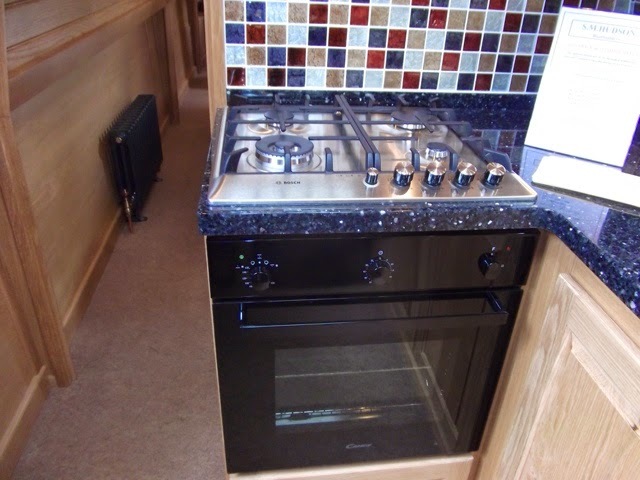 Oven,hob and Avonite worktop with glass tile splash back. 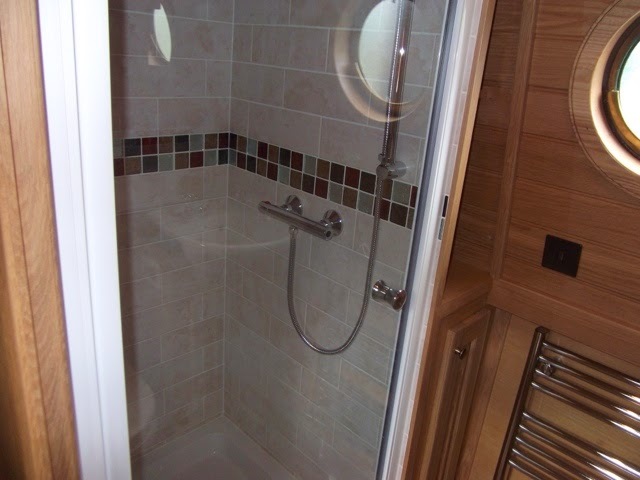 Shower room with 800 x 800 shower,sanimarin macerator toilet. Rear doors now complete with castles. 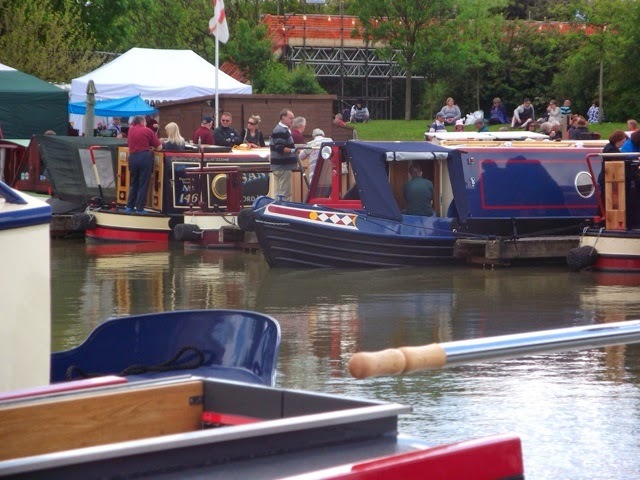 Viewing across the marina from the working boats. We departed the show on Saturday about 15 minutes before a horrendous hail storm and were back at the Ibis hotel. 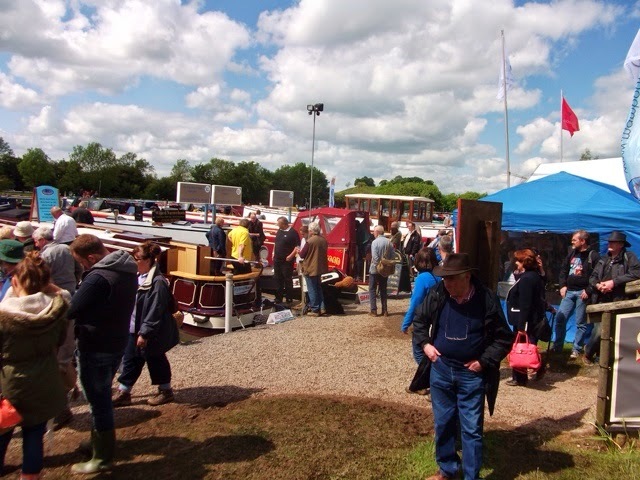 Saturday must of been hard work for the exhibitors because the water and mud got everywhere. Sunday dawned and what a difference. Warm sunshine and a nice breeze. All the photos above were taken on the Sunday. 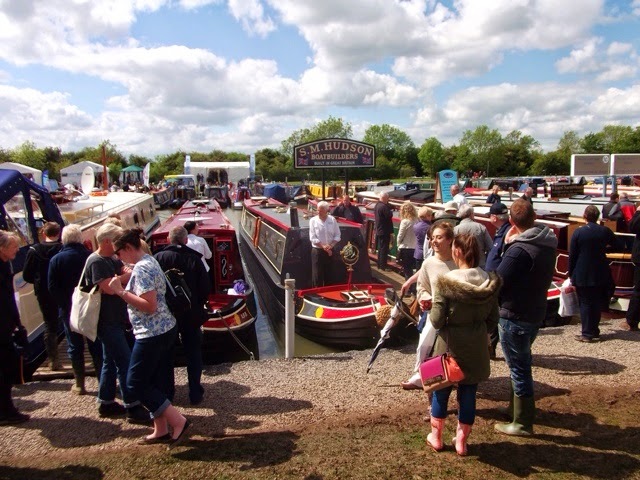 During the day sitting in the area of the food stalls we met some friendly people who moor at Crick. 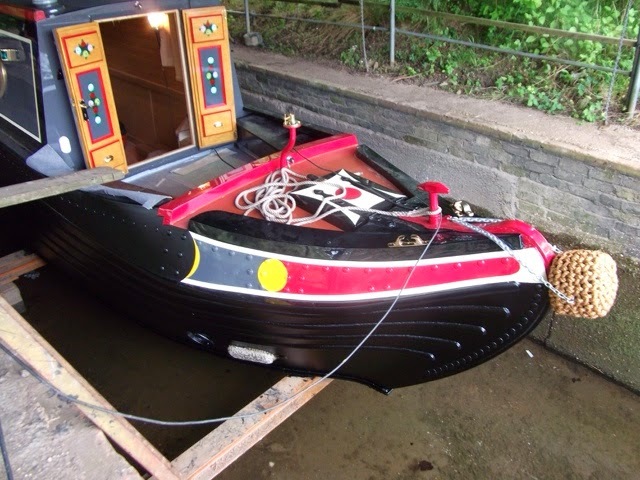 We enjoyed chatting as Achernar will moor at Yelvertoft on the rare occasions we are not out cruising. We kept an eye out for some other bloggers but did not see any to talk to. 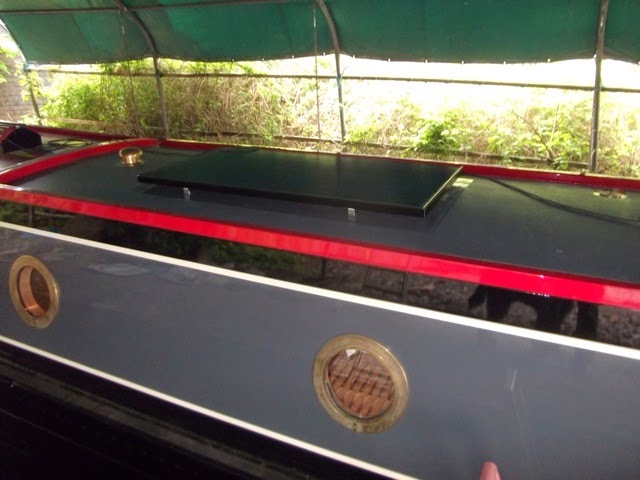 Oh well there will be plenty of opportunity soon out on the cut. 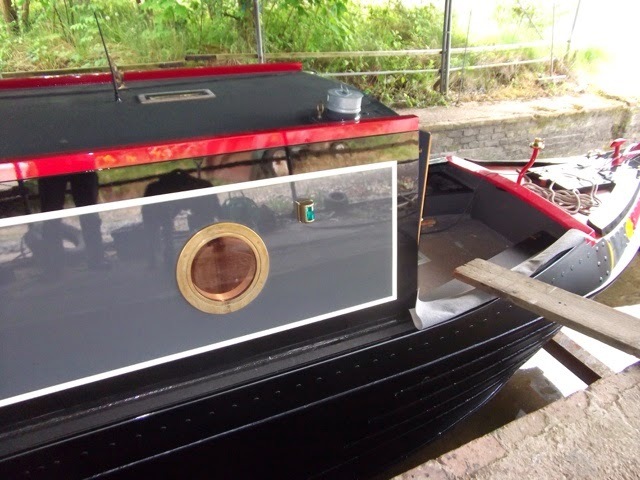 So now Achernar will return to Tamworth departing Crick on tuesday morning. 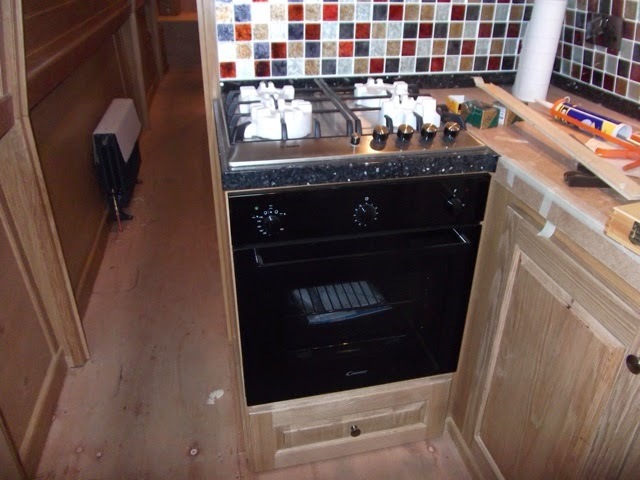 She will then have her permanent flooring (Karndean) laid and a few final tweeks made before being handed over to us. Well we are nearly there. The whole process for the build has taken 15 months so far. 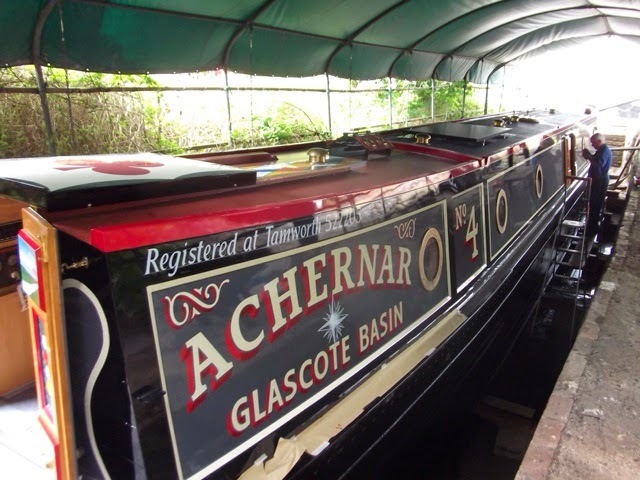 On Friday we took a trip to Tamworth to take a peek at Achernar before she sets sail ( if that the correct terminology ) for the boat show at Crick. 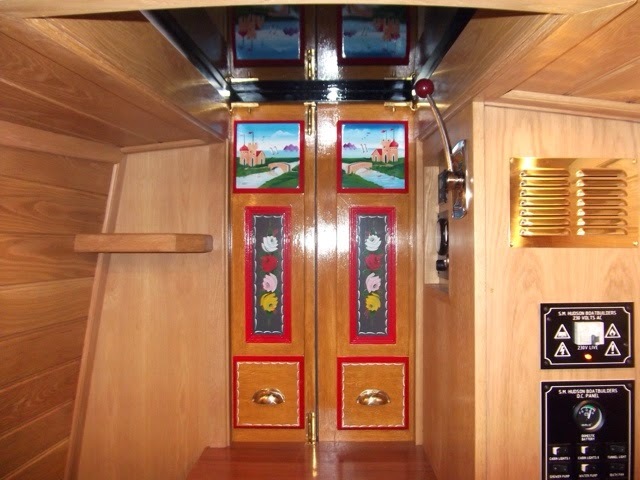 Achernar was in the dry dock being re blacked and the sign writer/artist was busy painting the roses and castles to the internal doors. 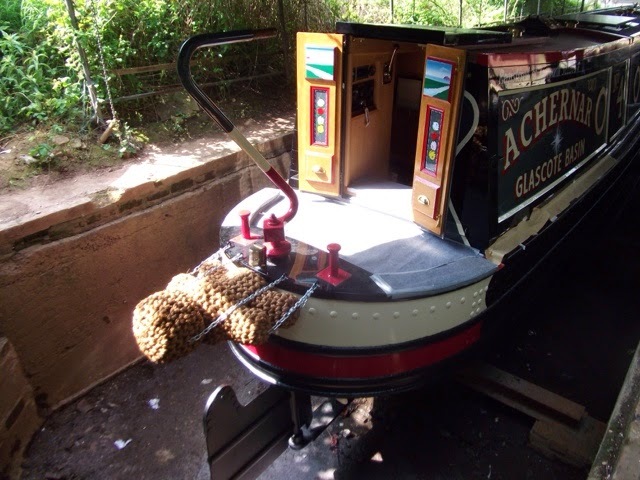 Achernar is due to depart Glascote Basin on Wednesday morning along with two other boats from Hudson Boatbuilders. 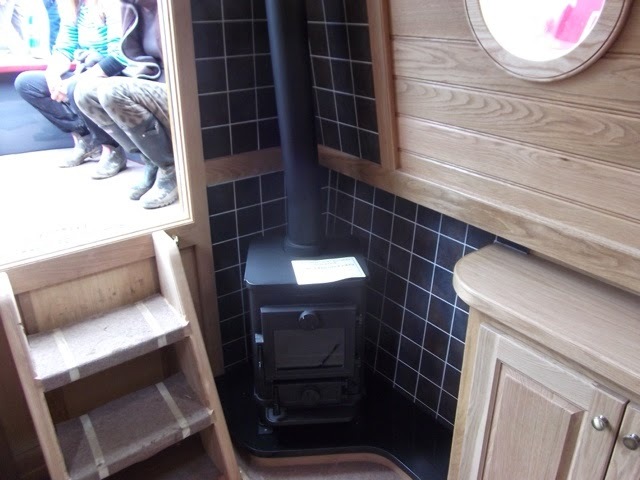 As the final preparations were being made the inside was still partially covered and full of tools and other bits and bobs. It will be great to see it at the show all clean and polished. Here are some photos. You can just see the brass mount for the Francis searchlight. 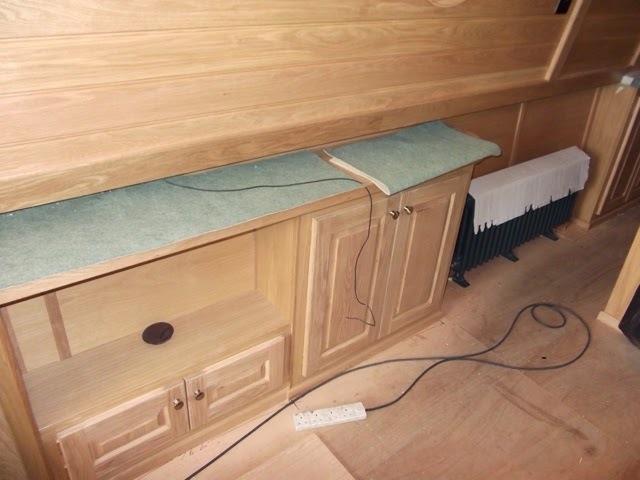 The TV cabinet will contain a 27" LG smart television. castles in the top panel. So now we wait until Saturday. We are spending two days at Crick and no doubt will be shopping for various bits for the boat. 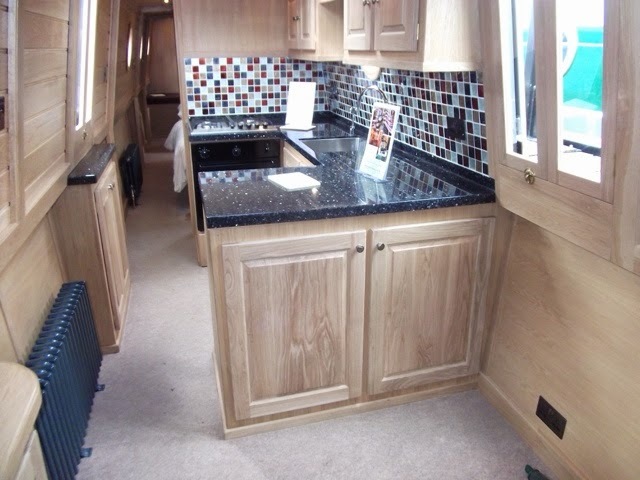 At the conclusion of the show Achernar will return to Tamworth to be completed with Karndean flooring and initial engine service prior to handover. 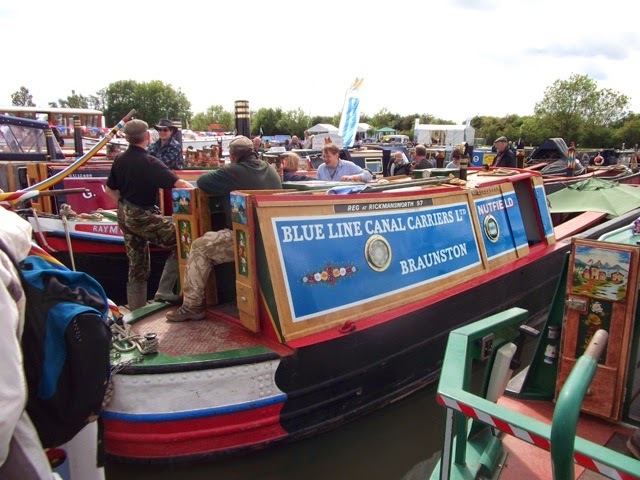 Our plan is to stay at Glascote Basin for the Hudson open weekend at the end of July and then commence our initial cruise mid August.